In the final countdown to the UN General Assembly vote on recognition of Palestine as a non-member state, the PLO has indicated that it’s expecting “a pleasant surprise”, it being the number of European countries which will not do Zionism’s bidding on this occasion and will vote for the resolution. Victory for the Palestinians in this forum can be taken for granted, and it will help to further isolate the Israel of Netanyahu as a pariah state, but… It won’t be, can’t be, a substitute for a viable strategy to secure justice for the Palestinians. In my analysis the Palestinians now have only one option. As I have previously written and never tire of saying, the Jews are, generally speaking, the intellectual elite of the Western world. And the Palestinians are by far the intellectual elite of the Arab world. What they could do together in peace and partnership in one state really is the stuff that dreams are made of. They could change the region for the better and by doing so give new hope and inspiration to the whole world. As things are and look like going, and given that the Palestinians are never going to surrender to Zionism’s will by accepting crumbs from its table, the only alternative to one state for all is a final Zionist ethnic cleansing of Palestine. That might buy Zionism some more time for the short term, but in the longer term it would most likely guarantee that the rising global tide of anti-Israelism was transformed into classical anti-Semitism, setting the stage for Holocaust II, shorthand for another great turning against Jews everywhere, and starting quite possibly in America. The question arising from the summary analysis above is this. Where does UN General Assembly recognition of Palestine as a non-member state fit into what I have proposed? Answer – it does not fit. So what use could “President” Abbas make of it when he gets it? The Palestinian Authority (PA) has long became a liability to Palestinian cause. It should have been disbanded long time ago. It's kept alive by the US-EU-Israeli axis of evil. PA president, Mahmoud Abbas, who lost his mandate in January 2009 - has since proven to be a western double agent. A 'non-member' status at the UN will not bring dignity or liberation to the starving Palestinians who have become strangers in their ancestral land. During the recent Israeli attacks on Gaza, Mahmoud abbas played the part of an armchair warior. However, Palestinians saw that this barking dog has no teeth to bite. The so-called "two-state solution" is a myth from day one. It's coined to buy more time for the Zionist regime to grab the remaining 22% Palestinian land. Your ideas are right on; however, I think the Zionists will choose to exterminate Palestinians worldwide, as possible. I think that this is pretty much policy right now only in slo mo. Under crisis, the policy would become more direct and aggressive. I think we must all figure out now how we can oppose this "final solution." Maybe BDS, maybe armed intervention, maybe nothing...I just don't know. Zionism is not going to tolerate a bi-national state so it has to be called out, as you suggest, and then defeated somehow. Alan,You are So Right in all your Observations of this On-going World - Provocation for WAR...That is Being Put On fire in That Place Called Israel. I don`t see The Palestinians Becoming Any more Lenient than They have been. Not for Peace..Not For Pacifism To these Zionists..Not even for Life. It is Long passed Due for israel to back off...And Out of Palestinian Land.. And Past Due time That This US of A.. Told b.netty to go Hang Himself..That No more of OUR Finances..Or The Blood of OUR Young Men is To be Spent On that Objective They Are Aiming for..OWO. NO MORE Zionism is DEAD and will soon be buried. Thank you so much for this post. Arguments against a single democratic state (with a constitution) would be quickly seen as racist if white supremacists used the same language. Is it so different when some Jewish people and many so-called progressive-left organizations openly declare fear of "demographics" and "loss of majority"? I'm embarrassed and disgusted that our own president bows to Netanyahu's demand and refers to Israel as a "Jewish" state although some 20% of its citizens are non-Jewish. Even Truman didn't do that. As nomorenakba observes, there is no more telling evidence of Obama's capitulation to The Lobby than his references to Israel as the "Jewish state." When he first did so, I emailed him the question, "Mr. President, 20% of Israeli citizens are Palestinian Arabs. As a member of a 13% minority, how would you feel if foreign leaders referred to the US as a "white state"? Recognizing Palestine at the UN, as a non-member state, is a step of many more yet to come. With all the hatred among israelis, a one-state is not the solution. Palestinians, then as now, would always be 'second class citizens'. Go back to the 1967 borders and thus give Palestinians their own nation. 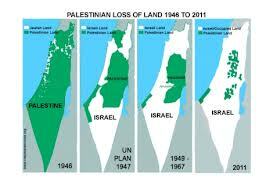 The Western world rooted for the formation of israel - don't Palestinians deserve this too? Dear Alan. I think many people are coming around to the one-state solution. But... Even if what you write were to actually happen, and a 'one state' solution was implemented and declared, what would happen to the two-tier discriminatory legal and education system; the apartheid, jew-only roads; the no-go areas for non-jews; the checkpoints; the wall? South Africa was only 'one state' but STILL it operated with a segregationist policy against blacks. What would stop this 'one state' not continuing with its oppression and retaining what has been stolen (land theft and apartheid settlements), etc. Looking at S. Africa today does not fill me with confidence for a fairer situation: SA got rid of Apartheid and even got a black ANC government but all the countries assets were and are still owned and controlled by whites. As Mandela said, he got the rule of the country but not the keys to the safe with all the countries wealth. The majority of blacks are no better off economically now than they were under Apartheid. I am genuinley asking how you see a one-state solution working if much of the land and the water and the wealth renmain owned and/or controlled by Jews? Apartheid in South Africa at least kept the country from becoming the cesspool of crime and poverty it now is. There is one thing here which puzzles me. The way I see it, a two-state solution would only be possible if the Palestinian refugees were refused the right of return to their homeland. If they were allowed to return the Jews in Israel would find themselves in a minority and the Jewish State would cease to exist. Makes a helluva lot of sense...Abbas, Hamas and Allah willing. Well Alan; I agree. I have said much of the same before. The two state solution was never going to be implemented and cannot be now. I am angry as hell to hear last night that the Australian PM; Julia Gillard, was against supporting Palestine. If I get to see her in public I will let her know in clear language my opinion of that decision. I would like to address the myth of Jewish intelligence. I know many Jews and I have conversed with many zionists. I would say that they were weighted below average in intelligence. Another point mentioned by a few people concerned the distribution of assets. I am shocked that there is a suggestion that Palestinian people would have to purchase housing etc. The zionists government will need to pay compensation amounting to that taken in housing and other property as well as for crimes committed. On Holocaust II. I believe it will happen; that it will be less than 10 years away and that it will be perpetrated by Americans. Almost all zionist will move to the US; none will want to remain after the implementation of a single state solution and under a Palestinian government. This influx into the US and the treatment they will get from the US zionist government will fuel resentment amongst the US population. Broad publishing of material covering the financial burden of israel will follow; including the loss of life of their soldiers through zionists wars; the truth about 9/11 etc etc etc. AT this time the US will be a tinderbox brought about by it's financial position. @David King - Late professor Edward Said (MIT) had claimed that if ever Palestine is ruled by a Muslim majority - the great majority of European Jews would prefer to stay in Palestine instead of moving back to their ancestral European lands - fearing that antisemitism would be waiting for them. This was one of the reasons, the European Jews refused to migrate to Birobidjan, the first Jewish state established by Stalin in Russia in 1934. That Abbas is being pressured into returning to "talks" (euphimism for cover for ongoing land theft by Israel) is indicative of the power of Zionist influence on outside governments that are exerting the pressure. Zionism is not about Israel-Palestine. It is a far more insidious force than is apparent by its regional criminal activity, as its tentacles reach into the very hearts of imperial powers, finance and media worldwide. I remember reading not that long ago; of a poll conducted in zion. 40% of the population indicated that they would leave if a war started with Iran. This would indicate a willingness to leave rather than to tough out a situation. There are more things to consider. I will list a few things that come immediately to mind. 1. Living closely with the native people. Once again polls conducted in the past show that zionists will not accept living in the same apartment block as a Palestinian. How much more uncomfortable will it be to not only share everything but to be outnumbered? Palestinian people in your schools; in your pools and entertainment areas. In your clubs; in your workplaces. Palestinians managing your day to day activities and holding power over you. 2. Removed from you position of privilege. Losing your home; your job; your position in university etc. 3. Facing criminal proceedings for war crimes and crimes against humanity. 4. Having your children grow up learning the true history of Palestine and the role you and your family played. 5. Facing taunts from those Palestinians who lost family; property; who were imprisoned and tortured. 6. Being treated as a second class citizen. 7. Facing every day the realisation that you lost and will never gain respectability or your own country again. No; the zionists will scamper like cockroaches from the sunlight. I note that already the zionists in America are being considered a fifth column. I just saw some Australian news. At the bottom of the article is a related story. "The results of a government survey show that over half of the population of South Africa lives in poverty in the wealthiest African nation. The national agency Statistics South Africa conducted the survey in 2009 and released the results on Tuesday." The research showed that poverty levels in South Africa increased between 2006 and 2009. Zionism is not just about Israel and the Region. It has long ago metastasized, and is global; its tentacles worked deep withing all western governments, and the worldwide financial and media systems. I see that the Aussie article refers to a few youthful confused Jews living in Australia, one of whom is very conflicted (he wants to fight, as he is a pacifist). While these people apparently aren't Australian government sanctioned, this doesn't negate my claim that Zionism is an international problem. I apologize for commenting on an article I had not yet read. I have no problem with zionists in Australia going off to war in ersatz israel. I do have a problem with them being able to return to Australia. Those who want to fight for another country should not be allowed to return to Australia. Nor should we pay any of there costs. US citizens who go abroad to fight for their countries get attacked by Presidential drones.